London in December is a treasure trove of entertainment for families. We’ve lined up some of the most festive family outings, as well as some non-Christmassy ways to spend the dark December days. Battersea Arts Centre kicks off the month with an immersive adventure that pays tribute to Jeanie Nassau Senior, Britain’s first female civil servant, who lived in the very spot where the theatre stands today. In Return to Elm House, families will learn all about Jeanie’s inspiring story by following trails, engaging with the installations scattered throughout the building, and collecting clues that will eventually solve the mystery of Elm House. The show, which runs from 1 to 30 December, is suitable for ages six and over; ticket prices start at £12.50, with special family tickets available. A completely different kind of theatre adventure can be had at the Theatre Royal Haymarket, where Take That musical The Band arrives for its much-anticipated West End run. Although the soundtrack of boyband bangers might be more of a selling point for mum or dad, the story of five fans trying to fulfil their dream of meeting the band they love will surely appeal to younger music fans as well. The show comes to London with a slew of impressive reviews under its belt, as well as with the record of ‘fastest-selling theatre tour in UK history’, so by all accounts this should be a fun and feelgood way to while away a dark December evening. The Band runs from 1 December until 12 January; ticket prices start at £16.50. Ages 10+. 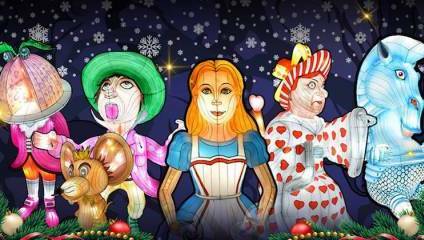 Another newcomer is Alice in Winterland, a new lights and lanterns festival pitching up in Southwark Park. Featuring a five-metre-high Alice alongside 159 other handmade lanterns arranged in 29 immersive scenes (including the Mad Hatter’s tea party), the display will provide interactive festive fun for the entire family. Traditional seasonal delights aren’t eschewed entirely: you can also pay a visit to Santa in his grotto or sing along with favourite Christmas hits - performed live on stage. Alice in Winterland is from 28 November until 5 January; adult tickets are £15, with concessions and family tickets available. If you’d rather stick with a classic, plan a visit to Tower Bridge on its monthly family day, which falls on 15 December. There will be a range of interactive, child-friendly activities, which this month centre on the animals that live in the Thames. Family day events are included with your regular ticket; adult admission is £9.80 with a range of discounted family tickets available. Meanwhile, anyone living locally who’s not gotten around to visiting London’s biggest landmark yet might like to put a date in their diary soon: special community tickets of £1 are available to residents of Southwark, Tower Hamlets and the City until March 2019. Families looking to spend the 25th out and about might consider a trip to JW3’s Family Winter Disco, which is aimed at children aged 7 and under. The fun starts off with craft activities and games, followed by a proper disco party complete with snow, bubbles, lights and kids’ entertainer Ilana Banana. And if there’s still excess energy to burn off after the dancing, the centre’s ice rink will also be open. Tickets for the Winter Disco are £7 for children and £3 for adults; tickets for the ice rink must be bought separately. Alternatively, pay tribute to the man responsible for reinventing Christmas on a Christmas Day Charles Dickens walk. The two-hour tour will take in the Victorian buildings and alleys around Covent Garden and even dip into the darkness of subterranean Victorian London, all the while exploring the traces Dickens left behind through his life and his writings. With a special focus on Victorian Christmas traditions, this outing will be seasonal and educational at the same time. Adult tickets are £10, children go free.